Tweet Are You Carb Ready for a 5-Set Match? Imagine you’re a college freshman volleyball player. You’re experiencing a lot of changes: tough course load, time away from home, harder practices. And if you’re from best-of-three states like Illinois, Kentucky or West Virginia, you may also be wondering what it’ll be like to play five sets. This transition from high school to college isn’t easy for anyone, but fueling yourself with carbohydrates could help propel you to the next level. As an athlete, you need carbohydrates to provide energy and fuel to your muscles and brain. Carbohydrates are stored as glycogen in muscles or as blood glucose in the liver. During a volleyball workout or match, the glycogen energy stores in the muscles are what is primarily used. Depending on the duration and intensity of the workout, these muscle stores can become very depleted. If you don’t eat enough carbohydrates, it can be detrimental to your energy levels and performance, as well as your concentration and thinking. It’s not just about consuming carbohydrates. When and how much you eat is just as important. Let’s break it down. Although the exact amounts differ depending on the athlete and duration of exercise, a good rule of thumb is to consume about 1-4 grams of carbohydrates per kg body weight. This means that an athlete who weighs 154 lbs (70 kg) should consume between 70-315 g of simple carbohydrates about 30 minutes to an hour before a match to provide quick energy to the muscles. Fueling during a match is important, but only if it lasts longer than 1 hour. For every additional hour after, it is suggested to consume 30-60 grams of carbohydrates. This can be tricky when sometimes we aren’t sure how long a match will go. Just in case it does go to 4 or 5 sets, it is important to be prepared with snacks on the bench to eat. Refueling within 30 minutes after a match is also a key factor for performance because it helps you recover faster. No matter how much you eat before or during the match, you will still need to refuel with about 30-60 grams of carbohydrates immediately following. Protein is also a component of post-match recovery because it helps rebuild some of the muscles that were broken down during the workout. Consuming 10-20 grams of protein immediately after a match can also help reduce muscle soreness. It is important to be able to maintain energy by fueling with carbohydrates throughout the day whether it is a training day, competition day, or recovery day. The exact amounts will vary for each individual, but it is important to remember to be eating whole grains for at least half of your carbohydrate intake. The timing and amount of carbs you eat before competition, after competition, during competition, and throughout the day have a big impact on your performance. 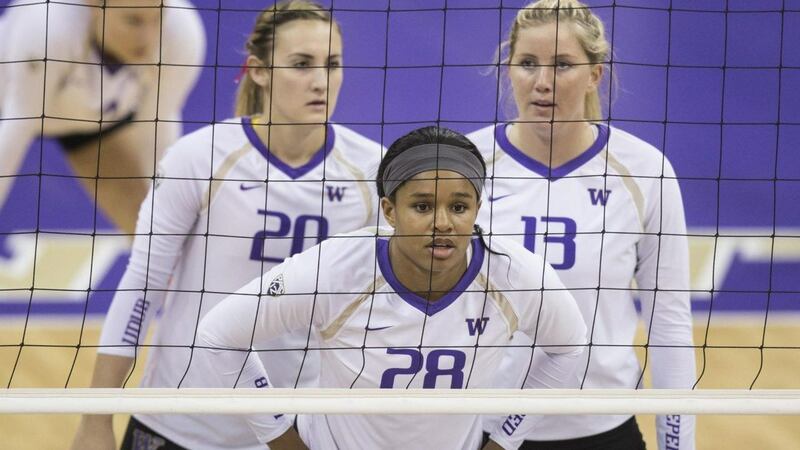 While the jump from high school to college can be a challenge, it is also hard to know when a game will go five sets. It is important to have a plan and be prepared to properly fuel for success on and off the court. Consult a registered dietitian nutritionist for a more individualized plan to help achieve your goals.